Chicken Leftovers blog | Come and Cook! Ok so read on if you are an omnivore and eat good quality chicken as a source of protein…. Chicken is really low in fat compared with other meats. Chicken is really low in saturated fatty acids compared with other meats. 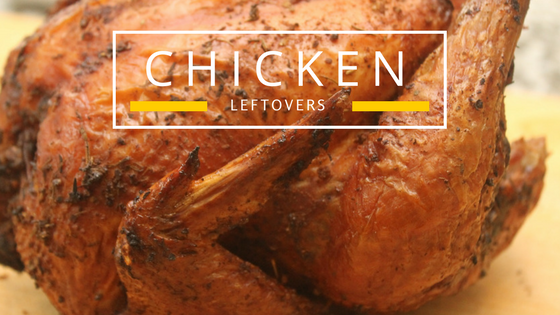 Chicken is good for those carnivores who are looking for dinners on a budget and perfectly suits families for leftovers. We probably cook a chicken about once a fortnight as it is great for quick meal and lunch ideas and prefer a free range, plain chicken to the pre-cooked which are generally over-cooked and over-salted. The average chock will take about 1hr and 15 mins to cook through at 180°C and I prefer to cook it breast side down for the first 50 mins and then breast side up for the remaining time. Baste can be lemon, a little butter ( under the skin if you prefer), salt and pepper and I cook it in the roasting pan with about ½ cup of water that needs to be checked occasionally to see that it doesn’t dry out. Adding in the par-boiled potatoes at about 50 mins to go to the chicken pan ( or separately if you prefer a more crispy spud done in a little oil. Other veg like peeled and halved onions go in then and pumpkin pieces at ½ hour to go. Accompanying the roast are usually cauliflower ( in a cheese bake or plain…I adore a cheesy bake but my son has gone off it), green beans and carrots. It usually depends if I have shopped specifically for the roast or just use up assorted veggies from the crisper. Meat needs to rest for about ten minutes before cutting into it and serving with lashings of gravy if that is how you roll. Chicken coconut curry – Use the leftover meat as a part of a curry dish the next night with a mild, sweet mango and coconut chicken dish and lightly cook the veg such as carrots, snow peas, bok choy and red capsicum before adding in the cooked, diced chicken a couple of minutes before taking it off the heat. Serve with rice and salad. Pesto Pasta– Cook the pasta as per packet instructions and then five minutes before it is finished cooking, add in some frozen peas and broccoli and cook it in the water too. Drain and mix in grilled red capsicum, cooked, diced chicken, lemon juice, pesto and serve with a sprinkle of parmesan cheese ( or if you are a spice addict, some hot chilli sauce). Pick- a-Plate – A friend introduced this concept as a dinner idea for kids to gain independence in their choices of what goes on the plate. Chopping up random veggies and protein from the fridge and presenting on a platter for the kids to help themselves. Our platter is usually made up of pretty random things from the fridge and could be; cheese cubes, boiled egg slices, cooked chicken, olives, lettuce, cucumber, capsicum, carrot sticks, baby tomatoes, grapes, partly cooked broccoli florets, cold pasta or cooked potatoes . Lunchboxes: Fresh chicken sandwiches are a hit and salad to accompany is usually the best bet as one of my two only likes the salad on the side. Sushi: chicken and cucumber or chicken and avocado seem to be a hit and actually only have to get up a little early to prepare this. Wraps with chicken and salad are a good choice and Quesdadillas ( two wraps toasted with cheese, chicken and tomato/ baked beans in the frypan then cut into segments) the kids love but are actually a good choice for a quick and easy dinner when you have no time. Asian chicken noodle soup. When most of the chicken meat is used ( 3-4 days max in fridge) you can boil the carcass to make a soup. Just cover the bones in a medium sauce pan with water and boil up with carrots, celery and onion for 1.5 – 2 hours and use as a stock for soup ( this may need seasoning so taste to check). Pick the meat from the bones before discarding and reserve this for adding to the soup just before serving. My kids love Asian style soups with rice noodles, thinly sliced vegetables and the flavours of garlic, soy sauce, sesame oil ,spring onion and ginger. Come and Cook is located at 11 Grenoble St, The Gap, Brisbane, Qld 4061. Call Karen to book on 0488 249595.